The five pieces presented here offer a musical panorama from composer Frank Ticheli. Light to dark, to joyous jazz celebration, it is all here for the listener. The first four pieces are among the best by this famed concert band composer. 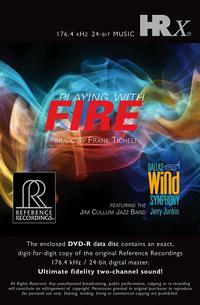 The final composition, Playing With Fire combines the mighty Dallas Wind Symphony with enthusiastic playing by the 7-piece Jim Cullum Jazz Band! Wind band fans and traditional jazz enthusiasts will revel in these splendid performances. Conducted by Jerry Junkin and recorded in the Meyerson Symphony Center, Dallas Texas, the great music and its exceptional sonic palette are expertly captured by Reference Recordings' world-renowned team of engineer Keith Johnson and producer Tam Henderson. America's premier professional wind band, the Dallas Wind Symphony, was founded in 1985 and has made more than 15 recordings. Consisting of woodwinds, brass and percussion, they perform and record in the I. M. Pei-designed Meyerson Symphony Center.